The Wesco Industrial Products 273289 specialty semi-electric pallet truck is made of steel, powered by two 24V batteries, and suitable for lifting and transporting pallets. Steel resists wear and corrosion. The loop-shaped pump handle can be used to jack up the forks and maneuver the pallet truck. The pallet truck can move up to 2.8 miles per hour with a load. The built-in charger can be used to recharge the 24V batteries. The polyurethane wheels won't puncture or go flat and are resistant to impact and wear. This pallet truck has a load capacity of 3,300 lb., weighs 518 lb., and measures 54 x 27 x 69 inches overall (H x W x L). (H is height, the vertical distance from lowest to highest point; W is width, the horizontal distance from left to right; L is length, the horizontal distance from front to back.) It has a service range of 3 to 7.5 inches high. The forks are 48" long. The steering wheels at the handle measure 2" wide and 7.25" in diameter. The load wheels at the fork tips measure 3" in diameter. Pallet trucks, also known as pallet jacks, skid jacks, and pump trucks, are used to lift and transport pallets or skids of goods. 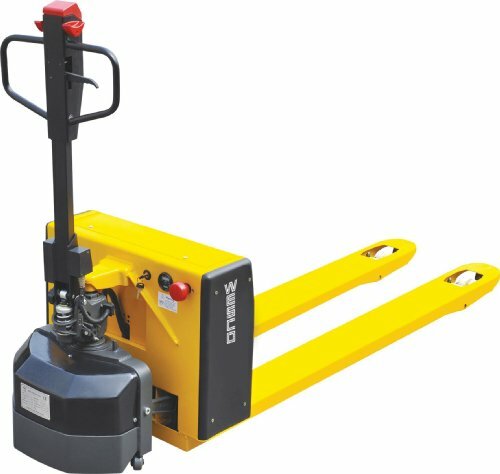 Pallet trucks can include a swivel pump handle, a squeeze trigger, two forks, and wheels for maneuverability, and typically contain a hydraulic cylinder or a battery-powered motor to raise and lower the forks. Some pallet trucks have an adjustable push rod on the bottom of each fork, allowing the user to modify the height. Pallet trucks can be used in warehouses, storerooms, shipping facilities, and a variety of industrial environments. Wesco manufactures material handling equipment. The company, founded in 1948, is headquartered in North Wales, PA. If you have any questions about this product by Wesco, contact us by completing and submitting the form below. If you are looking for a specif part number, please include it with your message. Vestil SPS-HD-2252-6MR Rubber-on-Steel High Duty Truck, 21.5" x 51"
Vestil SPS-HF-2852-6MR Rubber-on-Steel High Frame Cart, 27.5" x 51"